Iona and its surrounds have an abundance of thriving wildlife due to a number of important reasons. The air and water quality is very high as there is little if no pollution or development making for the ideal wildlife environment. Being a west coast island, Iona is a haven for birds, sea birds in particular. The shoreline and beaches provide the chance to spot oyster catchers, sandpipers, redshanks, plovers, curlews and grey lag geese. The endangered corncrake (Crex crex) also inhabits the iris beds near the machair. Raptors such as white tailed sea eagles, golden eagles, peregrine falcons, merlin and owls are also seen but less frequently. Otters are sometimes spotted in the north of Iona, and down at the ferry on the Sound of Iona, dolphins, porpoises and seals can be seen rising above the surface. 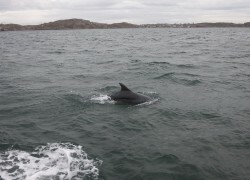 Even the occasional whale and basking shark have been seen swimming by.